Began his career in CMLL as a mini named Vaquerito. Moved up to the normal sized division in mid-2000. Due to his small stature he was just an opening match guy for many years, usually teaming with his brother Polvora. 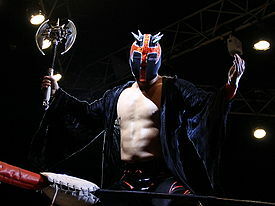 After losing his hair to Metal Blanco in Guadalajara in 2008 he started showing up as Inquisidor on cards in the Distrito Federal area in July of 2008 where he was positioned like a novato, but occasionally referred to as a veteran (like in the feud with Generacion 2011). Has participated in many of the bodybuilding contests run by CMLL and has been successful in them which has led to him moving up on the cards. In Luchas 2000 #583 (August 15), Inquisidor & Polvora came up with a cover story, claiming Vaquero was their older brother, but had tragically retired due to a hip injury. Inquisidor, as the youngest of the three, just happened to start his career just after his older brother retired. Inquisidor stated that if all three brothers had wrestled at the same time, they would be a tough to defeat trio. ??/??/?? hair Vaquerito Pequeño Blondie ? ??/??/?? hair Vaquerito Mascarita Mágica ? This page was last edited on 10 July 2017, at 03:15.